1. The outer casing is sealed. The flue, integrated with the outer casing, has two layers and reaches to the outdoor through wall. Oxygen enters from outside through the outer layer of the flue, and the burned gas is emitted to outside through the internal layer of the flue. 2. 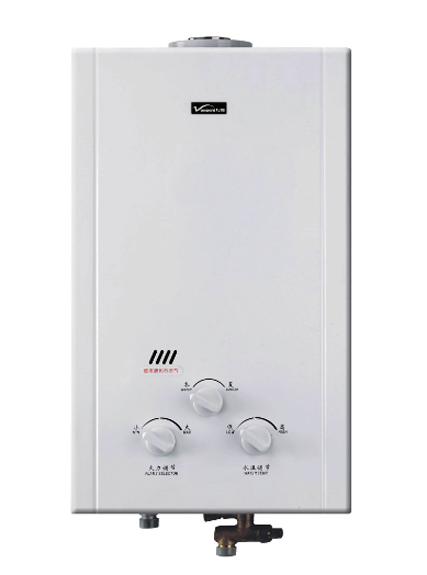 Gas fired balanced flue water heater is popular in developed countries, due to its high safety, multiple functions, convenient usage and high performance. 3. It is the safest water heater by far. It can work with flue to form a sealing system which isolates the indoor air and will not consume indoor air or pollute it. 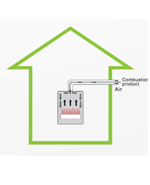 The oxygen needed for combustion is taken from outdoor, and exhaust gas is emitted to the outside. In this way, oxygen indoor will not be consumed, and no indoor anoxia will occur. 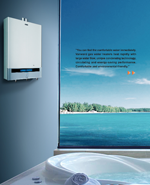 Therefore, forced exhaust and air-supply water heater can be installed in the bathroom. 4. 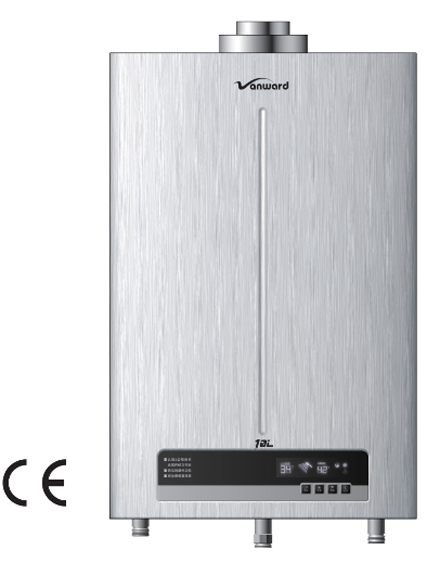 In view of the development history of water heater, forced exhaust and air supply water heater is the tendency and best choice, and it makes water heater indoor installation become a reality. 1. It is endowed with good safety, high heating speed, large water flow, high thermal efficiency, stable temperature, little incrustation, environment protection and tiny space occupation and free of control of water flow. 2. Outer casing of forced exhaust and air-supply water heater is fully sealed and gas is exchanged outside, which will not consume or pollute indoor air. 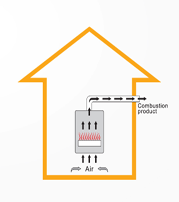 The combustion product generated during combustion is emitted directly to the bathroom, and the air for combustion is taken from the bathroom too. It is easy to cause CO poisoning and insufficient oxygen supply, so flue type can’t be installed inside the bathroom. 2. Use forced exhaust and air-supply water heater only after it is installed and tested by registered gas installer employed by registered gas contractor. 4. If gas leak is detected, turn off the main gas switch immediately, and notify the appliance dealer. Do not use the gas water heater until it has been repaired. 1. Gas exhaust flue must be installed on the outer wall which connects the air. 2. 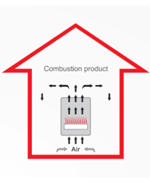 Gas exhaust sleeve must be firmly linked to the gas water heater and ensure good air-tightness. 3. Installation must be performed by professional installation company. 1. 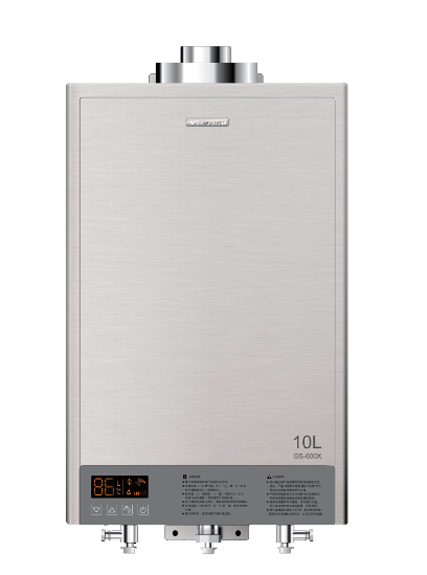 Read and follow the instruction for the clean and maintenance of gas water heater. 2. Ensure the room is in good ventilation. 3. 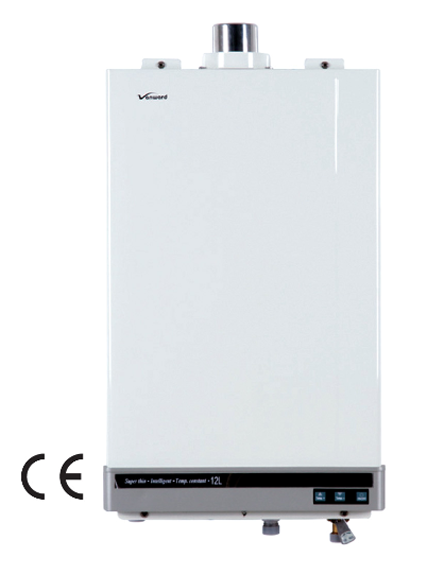 Stop using the gas fired balanced flue water heater when there is gas leakage, water leakage, and flame after water failure, as well as bad working environment. Notify gas administrative department or manufacturer for repair, and do not dismantle or repair privately. 4. Invite technician appointed by gas administrative department or manufacturer to clean and maintain it periodically, and check it in time, to keep gas water heater working in good conditions. 5. Please do not use overdue water heater clearing and maintenance agent. 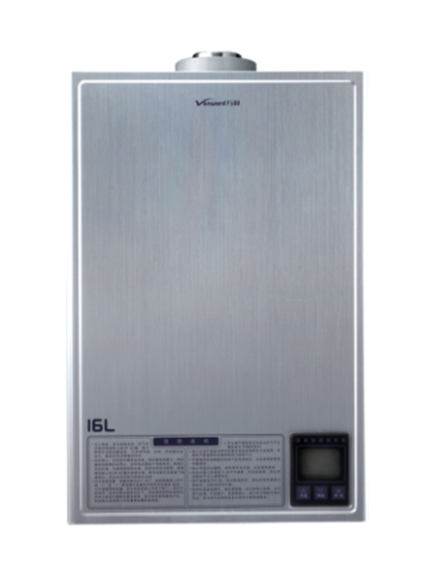 According to GB17905-1999 "Domestic Gas Appliance Safety Management Regulation”, from the date of selling, the service year of liquefied petroleum gas and natural gas water heater clearing and maintenance is 15 years, and that of artificial gas water heater if 10 years.